Seattle Health and Fitness Professionals: LIQUID CALORIES...What’s Your Intake? Over the last 37 years the total daily intake of calories from beverages increased 94%, now amounting to an additional 222 calories per day. Note that in one year, just one daily 12-ounce soda can increase your weight by 16 pounds! 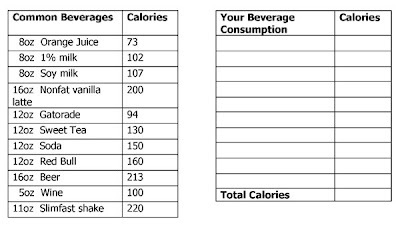 When keeping track of calories don’t forget that everything you eat and drink counts! When watching your calories water is always the best option. It has zero calories and will keep you hydrated! 100% fruit juices and low-fat milk are good high calorie beverages since they supply other nutrients such as vitamin A, vitamin C, and calcium.